Shirley MacLaine movies: Billy Wilder's The Apartment with Jack Lemmon. It's too late for me to recommend The Apartment, though recommendable it is. For one thing, this collaboration between Billy Wilder and screenwriter I.A.L. Diamond features what is, in my view, Fred MacMurray's best performance by far. Usually an intolerable leading man – macho, reactionary, humorless, unsexy, dull – MacMurray could be a fascinating slimeball, as is the case in The Apartment. Some Came Running is pure melodrama. MacLaine has some good moments, while Dean Martin received what may have been the best reviews of his career for his performance as a professional gambler. Personally, I'd rather watch Best Supporting Actress nominee Martha Hyer, as the beautiful woman from the right side of the tracks. Arthur Kennedy was another cast member who earned an Oscar nod, in the Best Supporting Actor category; he lost to Burl Ives in The Big Country. (Hyer lost to Wendy Hiller in Separate Tables; MacLaine lost to Susan Hayward in I Want to Live!) Ah, Frank Sinatra is in this one, too. Ocean's Eleven is worth watching merely so people can compare it to the George Clooney-Brad Pitt-Matt Damon 2001 remake directed by Steven Soderbergh. Else, it's basically a waste of time, apart from a few celebrity cameos, including those of MacLaine, George Raft, Red Skelton, and early cowboy star Hoot Gibson. And to think that Lewis Milestone was the same guy who had directed All Quiet on the Western Front three decades earlier. I haven't watched The Yellow Rolls Royce. Anthony Asquith's movies could be quite good, even if a bit stately at times. Asquith had luck at the international box office with the all-star The V.I.P. 's the previous year, but lightning didn't strike twice for him. The cast in The Yellow Rolls Royce, however, is interesting. In addition to MacLaine, there are Ingrid Bergman, Jeanne Moreau, Omar Sharif, Alain Delon, Isa Miranda, Edmund Purdom, Rex Harrison, Joyce Grenfell, Roland Culver, Moira Lister, George C. Scott, and Art Carney. Terence Rattigan wrote the screenplay. In other words, the film must at least be worth a look. The Yellow Rolls Royce is also notable as Asquith's last directorial effort. 6:00 AM TWO LOVES (1961) A conservative teacher struggles with her values while teaching natives in New Zealand. Dir. : Charles Walters. Cast: Shirley MacLaine, Laurence Harvey, Jack Hawkins. Color. 97 min. Letterbox Format. 8:00 AM THE SHEEPMAN (1958) A tough sheep farmer battles the local cattle baron for land and a beautiful woman. Dir. : George Marshall. Cast: Glenn Ford, Shirley MacLaine, Leslie Nielsen. Color. 86 min. Letterbox Format. 9:45 AM TWO FOR THE SEESAW (1962) A conservative attorney considering a divorce gets involved with an emotionally fragile dancer in New York. Dir. : Robert Wise. Cast: Robert Mitchum, Shirley MacLaine, Edmon Ryan. Black and white. 119 min. Letterbox Format. 12:00 PM THE CHILDREN'S HOUR (1961) A malicious student tries to destroy the teachers at a girls' school. Dir. : William Wyler. Cast: Audrey Hepburn, Shirley MacLaine, James Garner. Black and white. 108 min. Letterbox Format. 2:00 PM IRMA LA DOUCE (1963) A Parisian policeman gives up everything for the love of a free-living prostitute. Dir. : Billy Wilder. Cast: Jack Lemmon, Shirley MacLaine, Lou Jacobi. Black and white. 143 min. Letterbox Format. 4:30 PM AROUND THE WORLD IN 80 DAYS (1956) A Victorian gentleman bets that he can beat the world's record for circling the globe. Dir. : Michael Anderson. Cast: Cantinflas, Finlay Currie, Robert Morley. Color. 182 min. Letterbox Format. 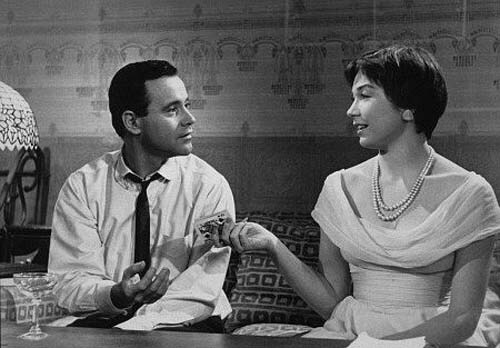 8:00 PM THE APARTMENT (1960) An aspiring executive lets his bosses use his apartment for assignations, only to fall for the big chief's mistress. Dir. : Billy Wilder. Cast: Jack Lemmon, Shirley MacLaine, Fred MacMurray. Black and white. 125 min. Letterbox Format. 10:30 PM SOME CAME RUNNING (1958) A veteran returns home to deal with family secrets and small-town scandals. Dir. : Vincente Minnelli. Cast: Frank Sinatra, Dean Martin, Shirley MacLaine. Color. 136 min. Letterbox Format..
1:00 AM OCEAN'S ELEVEN (1960) A group of friends plot to rob a Las Vegas casino. Dir. : Lewis Milestone. Cast: Peter Lawford, Dean Martin, Frank Sinatra. Color. 127 min. Letterbox Format. 3:30 AM THE YELLOW ROLLS-ROYCE (1964) A classic car changes the lives of three sets of owners. Dir. : Anthony Asquith. Cast: Rex Harrison, Jeanne Moreau, Edmund Purdom. Color. 123 min. Letterbox Format.